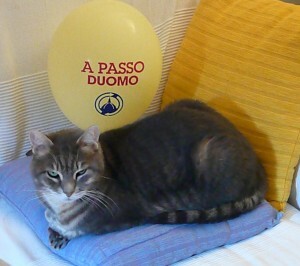 SUNDAY (October 25, 2009) Dante was worn out after all of the “A Passo Duomo” celebration around the cathedral. 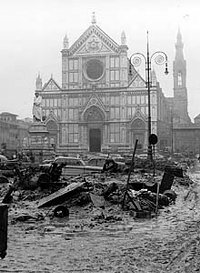 The new mayor of Florence had decreed that the entire piazza surrounding the Duomo would become a pedestrian mall instead of a busy thoroughfare where over 500 buses and thousands of taxis round the Duomo every day. To mark the renaissance of the city center, the mayor threw a party. 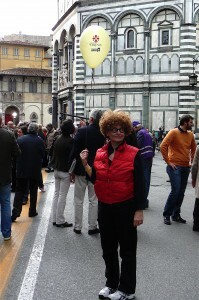 There were balloons and hot chestnuts and free entrance to the Baptistry. 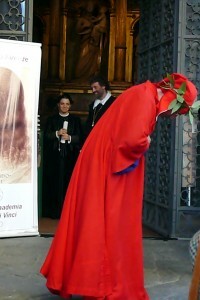 Notable figures from history – Dante, Galileo, Leonardo Da Vinci – made an appearance and wandered the square. A parade of costumed flag-throwers, drummers and trumpeters escorted an ancient bus on one last ride down Via Martelli. The Misericordia (the volunteer emergency medical service), located near the bell tower, displayed an antique ambulance. 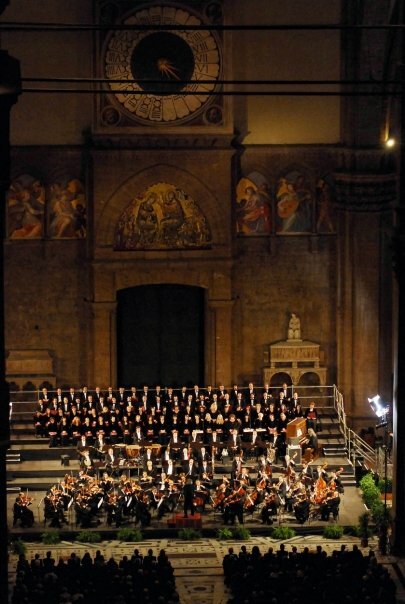 The day ended with Mozart, Bach and Mendelssohn echoing off the walls of the 600-year-old cathedral to a standing-room-only crowd, courtesy of the Maggio Musicale orchestra and chorus, directed by Seiji Ozawa. 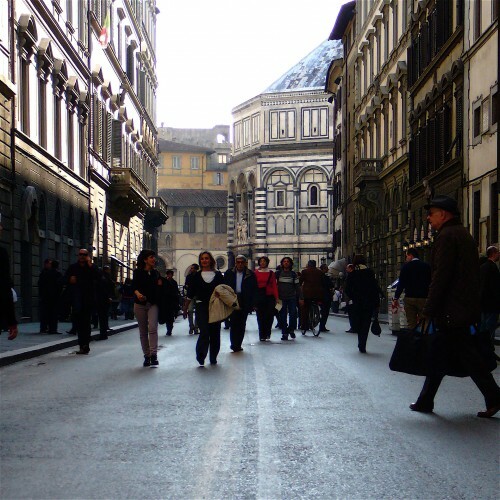 MONDAY (October 26, 2009) is a different wonderful life for those wandering the historic center of Florence. For one block in every direction of the cathedral, the streets are filled with tourists (and a few locals), not traffic. It has been suggested this will increase shopping in the historic center. It certainly makes it more inviting to linger rather than rush along. 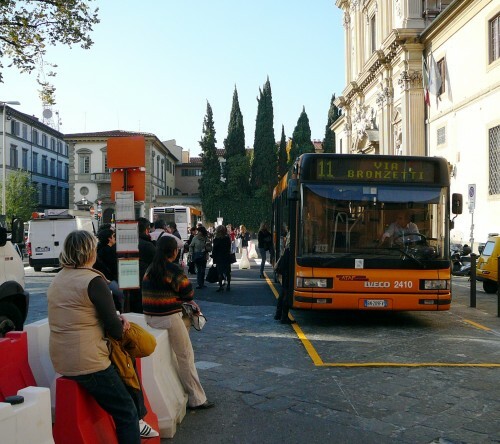 Some have tried to quantify the environmental impact, saying that it will reduce the 450 kilos of fine particulate matter and the exceedingly high levels of carbon monoxide trapped between the buildings that line the piazza. 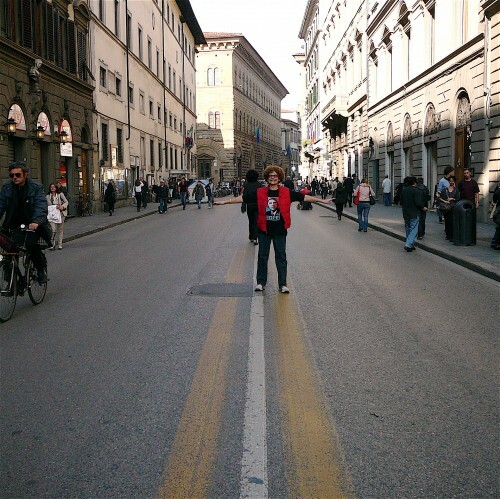 Florence is one of the most polluted cities in Italy – so every little bit helps. However, with the drastic changes in the bus routes, there are now over 2,000 bus traveling through Piazza San Marco every day. Maybe the mayor’s other decision to cancel the clean electric tramline routes throughout the city should be reconsidered. 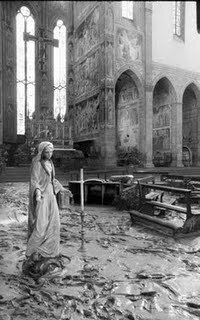 And now that the buses aren’t griming the Duomo, the bishop should consider steam-cleaning the back side of the cathedral. “Il privilegio della lentezza” or “the luxury of going slowly” is the creed of the artisans at the Antico Setificio Fiorentino says director Sabine Pretsch. Seemingly untouched by time, workmanship characteristic of the Renaissance is central to this small Florentine silk fabric workshop. 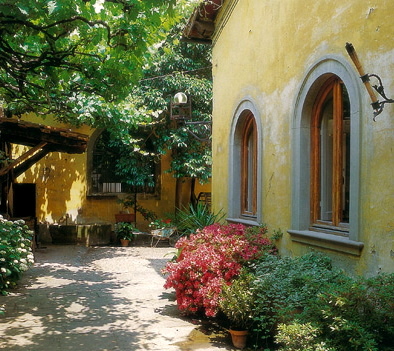 Any visitor will linger in this unhurried, magical place tucked deep inside a historic garden in the San Frediano district of Florence, Italy, where the looms are centuries old and the detailed patterns for the silken cloth are older still. Noble Renaissance families made their fortunes through the manufacture and trade of fine silks. 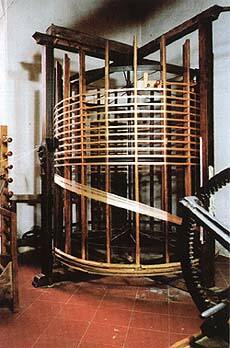 In the mid-eighteenth century, some of these families decided to create a single workshop to combine their looms, warping machines, patterns, and fabric designs. 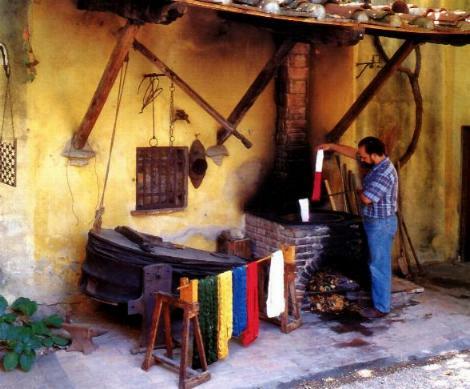 Located first on Via de’ Tessitori (“Street of the Weavers”) and then moved in 1786 to its present location on Via Bartolini, the silk workshop has never ceased operation, even when the roof was destroyed by bombs in World War II or when the workshop and storerooms were devastated by seven-foot flood waters in 1966. Today, the Antico Setificio operates with eight master weavers and two apprentices — all, but one, are Florentine by birth. The factory obtains raw spun silk primarily from Brazil. The silk is hand-dyed at the workshop, wound onto spools on a machine built in the 1850s, from which the thread is then transferred to quills for the shuttles or onto an orditoio (warping machine), one of which was designed by Leonardo di Vinci and the other is an 1872 Benninger orditoio — both are in perfect working order. Six handlooms from the eighteenth century and six mechanical nineteenth-century looms are used to create fabrics from patterns dating back to the Renaissance. 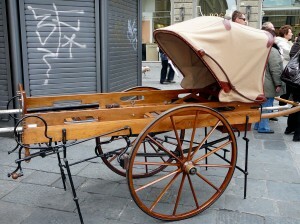 Today, the production of the Antico Setificio Fiorentino is rarely made into fashionable clothing. Instead, the fabric is used for the interior decoration of private homes and public buildings or the restoration of historic costumes, drapery and furniture. 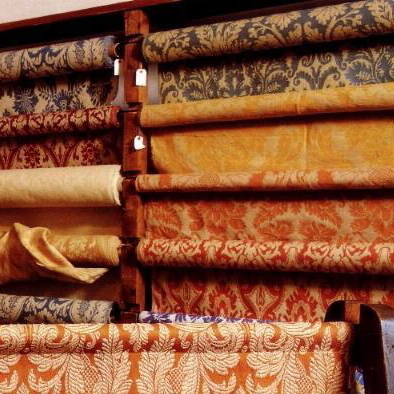 Visitors are welcome in la sala di vendita (salesroom) where rolls of richly colored and patterned silks vie for space with finished products made of the supple fabric. 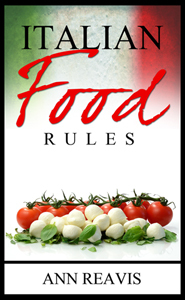 An excellent book, published in Italy, entitled “Antico Setificio Fiorentino” by Sabine Pretsch and Patrizia Pietrogrande, published by Le Lettre, Firenze 1999, has English translation included.